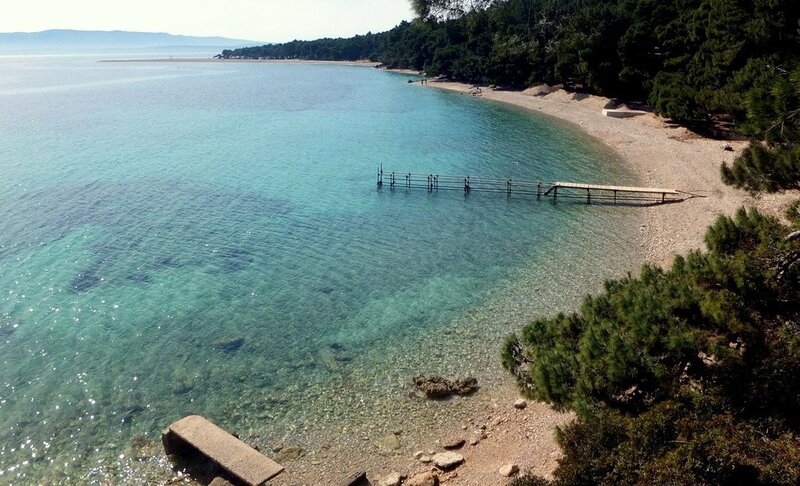 Our day trip to Brač, and the visit to Zlatni Rat Beach, was one of the highlights of our week in Croatia. 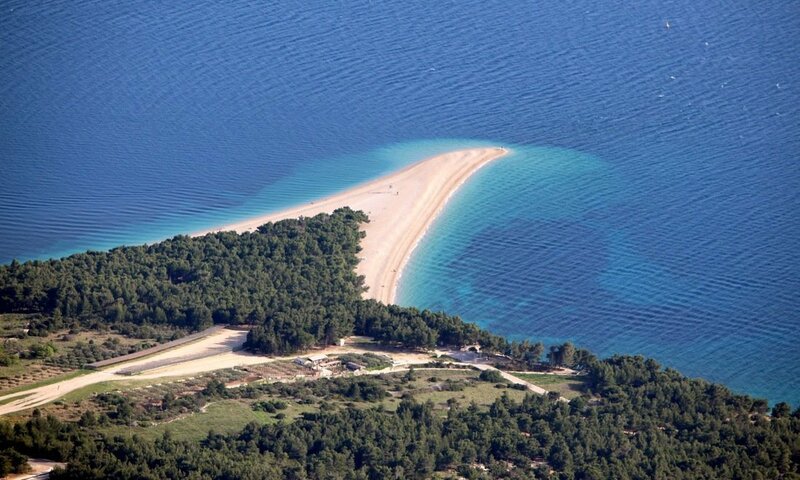 Brač is the largest island in Dalmatia and is easily reachable by means of a ferry ride from Split. 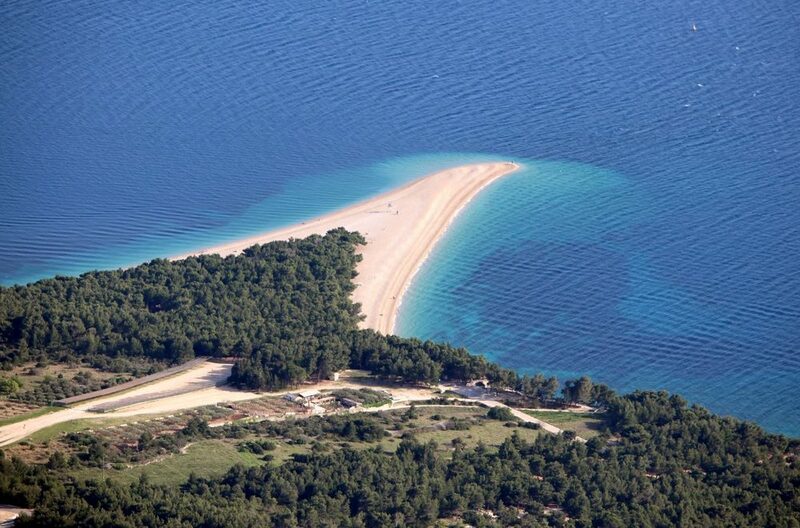 The cost of a one way ticket for a car plus two passengers is about 25 euro – the ticket for your day trip to Brač can be bought from the Jadrolinija office located within the main terminal building. Still sleepy and hungover from a wedding we attended the previous night, we hoped to find a good breakfast place whilst we waited for the ferry but none were open on a Sunday morning, not a great start to our day trip to Brač. So, we made do with some snacks from the supermarket and bad coffee from a machine both of which are located in the terminal building. The ferry ride is quite pleasant in good weather and is about 50 minutes long. 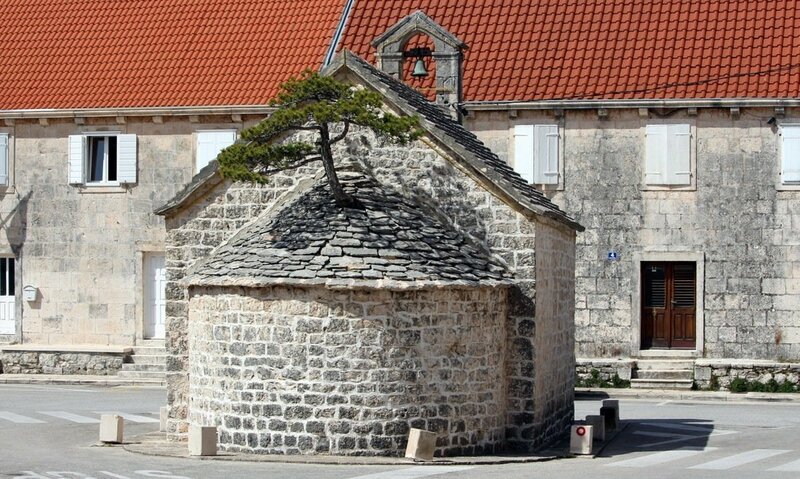 The ferry stopped at Supetar and from there we drove onto Nerežišća, a very sweet sleepy village with a chapel having a tree growing out of it. Besides a few other houses surrounding the chapel there isn’t much else. We did not see one single person in the village. I’m guessing that it was Sunday siesta time. We headed over to Milna, a picturesque village by the sea with a marina, a couple of restaurants and a church. Brač is very rural and you are more likely to encounter goats, donkeys and tractors on the roads rather than other cars. We stopped for a number of times to take photos as we drove along, leaving the car parked on the single lane road without it being an annoyance to anyone else since we seemed to be the only drivers on the island. 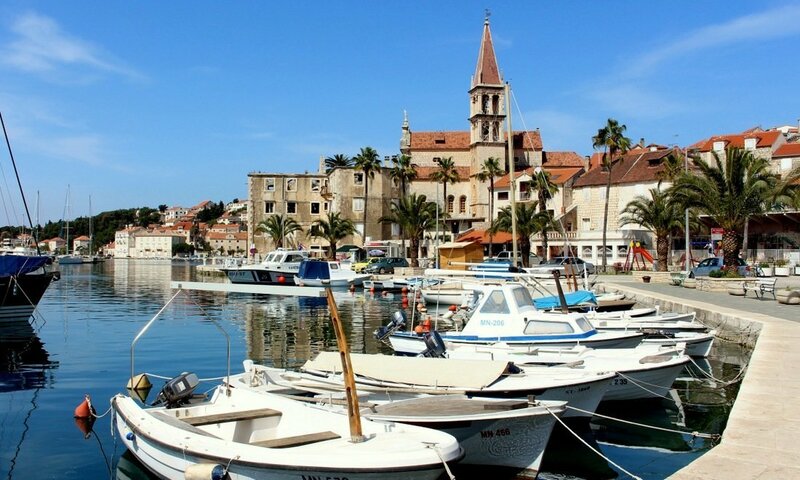 Our next destination during our day trip to Brač was Bol, the main town on the island. Bol has lots of beaches with very clear water in different shades of blue which at that time of year (April) were deserted and which was surprising considering that it was hot enough to swim. 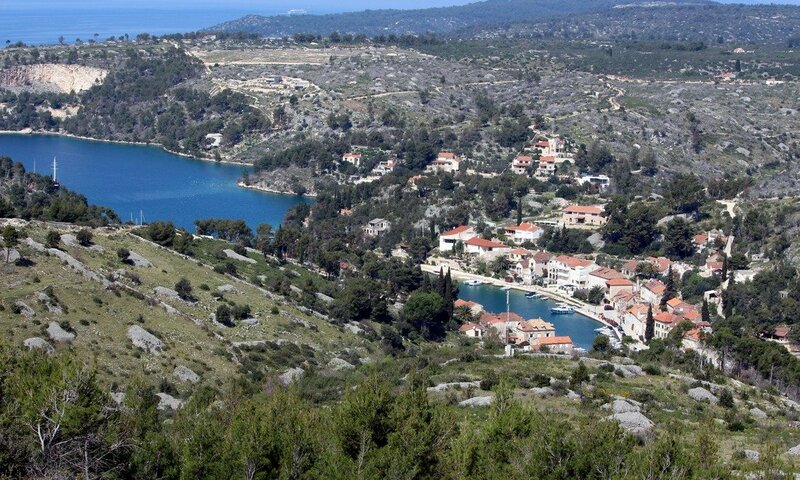 There’s a promenade by the sea lined with resorts and beach houses to the right of the town centre on which we enjoyed a walk up to the Zlatni Rat beach otherwise known as the Golden Horn. 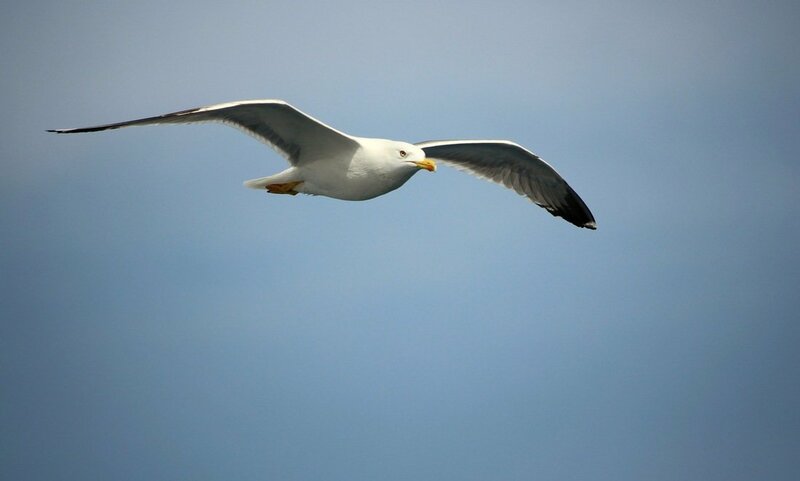 Bol is the more lively part of the island with a few restaurants, small convenience shops and hotels. There were a lot more people here (mostly tourists enjoying a cold beer under the shade of the cafe umbrellas) than on any other part of the island of Brač. 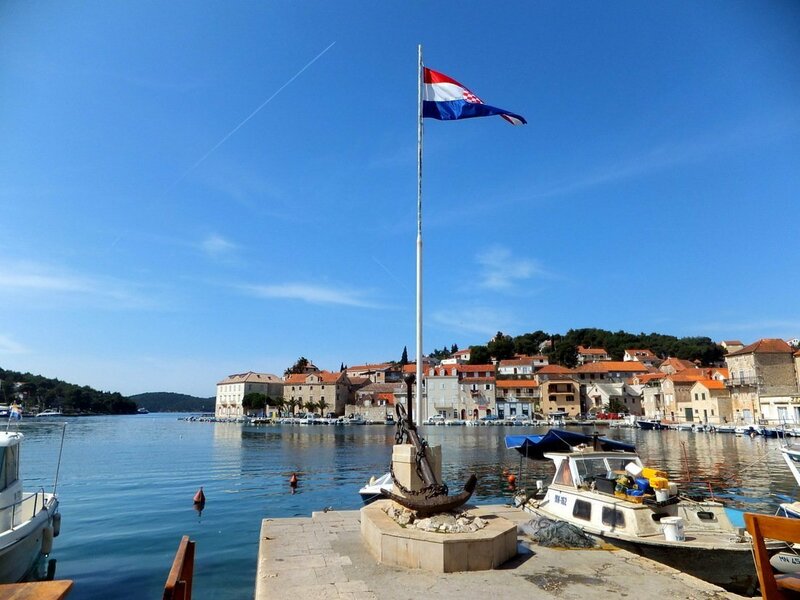 Seeing how great the weather was on our day trip to Brač, we decided drive to Vidova Gora, a mountain above Bol with spectacular views of Zlatni Rat (this is where the Golden Horn photo above was taken from) and Hvar, the island opposite Brač. This is definitely a must do for any traveller to Brač and if you’re not driving, you can take a two hour hike all the way up the mountain from Bol. We caught the 6pm ferry back to Split which was packed full so we were pretty lucky to have managed to get on. One word of warning – if you are planning a day trip to Brač on a Sunday, note that the gas station at Supetar is open until 8pm but the one in Bol closes some time after midday, so fill up in Split or in Supetar as soon as you disembark the ferry!